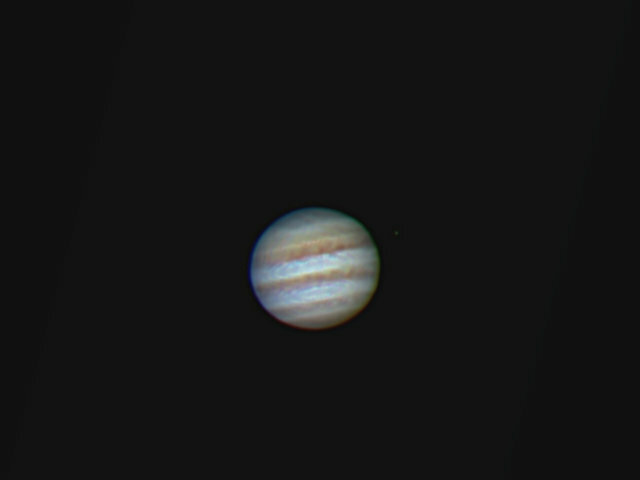 Here is a Jupiter image taken using a newly arrived Esprit 120. The scope is a replacement for a previous unit that suffered from pinched optics. The image immediately below is from the new scope and the one below that is from the unit with pinched optics. Both images were taken using the video capabilities of a Canon 60 Da in movie crop mode and processed in a similar fashion. The seeing was very poor for both images and really places limits on the detail that can be pulled out of the data. Processing This image was processed entirely in Images Plus. The 1230 best video frames stacked to produce the starting image in both cases. Levels used to set the white point. Statistical difference sharpening used as the first step to increase contrast and sharpness. Masked deconvolution used to sharpen the image further. Local sharpening applied in spots of highest detail.